Pros: The initial training and the ongoing customer support has been phenomenal. The specific industry and company tasks were tailor-made to maximize efficiency. There are many useful features available, such as easy search, analytical reports, finance modules, and shared notes, just to name a few that are constantly used. Uptime is 99.9%. I personally do not take the time to write reviews unless there has been an amazing experience with the product. Cons: There is a slight learning curve to find certain settings. Due to the many options available to customize the software to fit our specific applications, there are settings in several different areas, which is why I give the ease of use rating a 4/5 stars. Overall: Magna software has helped Jumpers accomplish our goal of providing good customer service and tracking operating aspects of the business. Sales automation, tour appointment automation, sales contracts, client support and commissions. Used seamlessly on the cloud, web, Macs, Windows, Android and iOS devices. Recommendations to other buyers: Magna Timeshare Software is a good value and a great investment; a primary tool for Jumpers to maximize ROI. Pros: One of the best features for me is that when uploading a csv file it doesn't crash the whole file if one record had incorrect data. That save me a lot of time trouble shooting. Cons: Not able to hand key in same day appointments. Overall: The site is very easy to use & the Magna staff are always available to help with any questions. One os the best features for me is that when uploading a csv file it doesn't crash the whole file if pne record had incorrect data. That save me a lot of time trouble shooting. Thank you for your review. 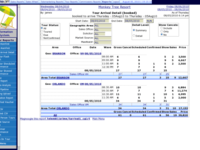 Magna Timeshare Software allows tiered user access. Based on users needs, menus items can be added or restricted for certain tasks. Same day appointments may be uploaded via the cvs file upload or by hand from a user that has access to the full lead management menu. Pros: Easy of moving from different aspects. Cons: Merging for servicing agents. Overall: This software is easy to use and allows for different functions depending on the users needs. There are options from Contracts, Commissions, Mortgage balances payments, Association fees, and many other features that are helpful. Overall: I can not say enough about the customer support they provide all hours all days, the program is in depth and customized as well as adaptable to every need, my staff comprehend and use with ease. Cons: install software. Contracts cant be easily changed. Original contract visual layout changes when uploaded to Magna. Comments section is limited. Overall: I feel product could be greatly improved if Comments section was not limited to 1 line comments. Also if the system was entirely web based, as opposed to having to install a program to run it. Magna does allow for unlimited NOTES entry. You may not be aware of and would like to use the web reports, NOTES section to enter your notes, which allows open line comment entry. Magna's contract documents are auto merge smart docs, which will auto fill the consumer data through out the documents for you as well as variable data/ verbiage based on the type of contract you are selling. Magna helps take a complex process and simplify it. Magna will know ,based on the sales line, product inventory being sold, cash out vs. financing variable and other factors, which documents or special verbiage needs to be printed for your type of sale. This helps make the contract process very quick and easy at time of sale. Pros: Uploads very easily on other sites it will reject the entire file with 1 error in it, with magna it tells you the error without failing to execute the operation. Great service, quick at getting back to questions! Overall: I am fairly new to this software, but the customer service has been phenomenal in the process of learning. They trained our staff well so we have the answers we need when we need them and if we don't know they are always available to ask. The program itself is very well organized and fairly easy to understand, once taught. Always new things to learn but definitely a great experience thus far. Thank you. Comments: We started using Magna a few months ago, and the learning curve was pretty steep. An entirely new program that we had to learn from beginning to end in terms of process - a huge transition for us to go to that from paper copies and spreadsheets. All of it has been totally worthwhile! We get things done faster and everything we need is all in one place. Everyone's work is accounted for and organized. Two thumbs up! Comments: Magna software makes my job easy. It has reports for everything related to timeshare and vacation club sales. I can see what tours are scheduled to arrive, who has arrived, what their status is and how many sales we have RIGHT NOW! It calculates the commissions for my sales people (including overrides) & it calculates commissions for my tour bookers, it even takes out the deposit and gift charge. Magna also manages my financed receivables, I can collect the payments and Magna will allocate the interest and principle for me. It has automated most of mine and my staff's tasks related to our sales process. Pros: Keeps everything organized and easily accessible, easy to use and friendly. Overall: Having using Magna only several weeks, you can tell a lot of work, love and sweat was poured into the making of this program. It is easy, fast and reliable and there are no complaints about it, I only wish there was an app version of it! Cons: Would benefit from simple to use instructions describing what each data field in blue screen is and how to fill it in. 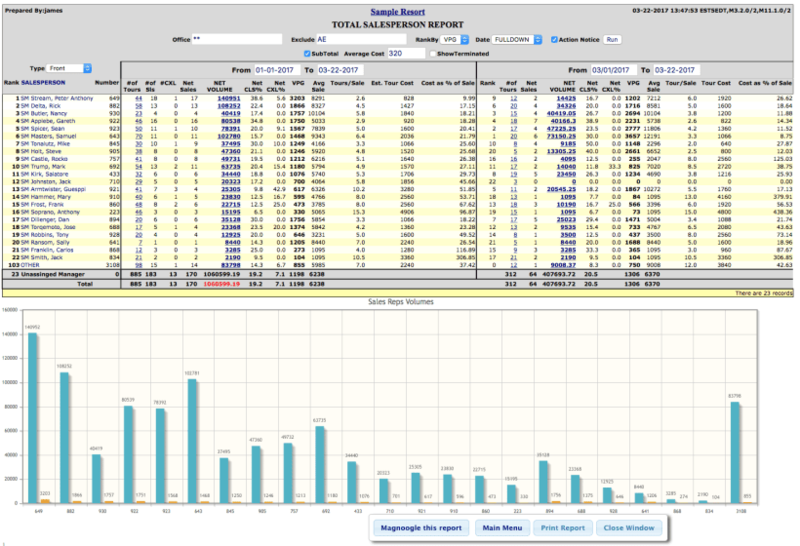 Overall: Using Magna has allowed our company to abandon cumbersome spreadsheets. This improves accuracy where it matters most - calculating commissions! 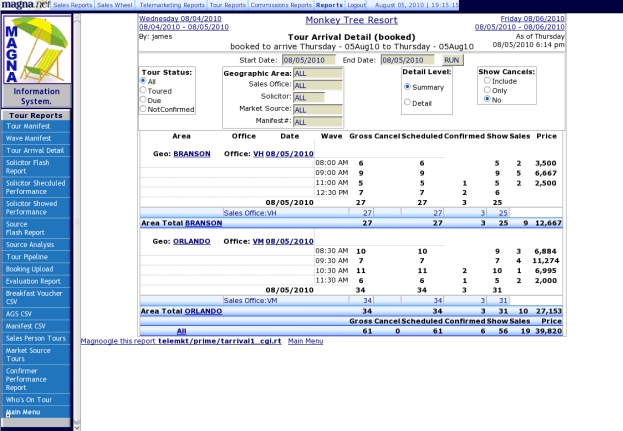 Comments: I love the ability to go online and pull up real time information about my employees tours. However, when it comes to entering these tours, I find Magna to be slightly painful. We go though each tour and hand enter it into the blue screen. There is a way to upload in bulk but there is always some kind of issue with the upload. I also cannot enter all of the data the needs to be entered, like a deposit and a 3rd gift. This is really the extent of my use with the software. The office staff uses other portions that I do not. Thank you for your review. Magna can customize the data fields for our tour upload to include the deposit amount and additional gifts or other fields that you need. Also, Magna can make custom lead upload, tour upload and mini vac upload functions to be compatible with 3rd party software export files when needed. I am sorry you have had an issue with uploading your tour file. Our customer support will be happy to help resolve this so you may use this function. Overall: I use Magna daily. Some aspects of the program are not easy to do, but overall it works for my purpose. Would like it to do a few other things. CS quickly responds. I appreciate it. 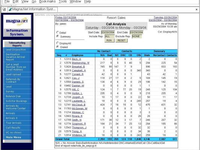 Magna Timeshare Software has thousands of built in reports, many with selectable triggers so one report may be used for many purposes. Our customer service would love to help you find the report you are looking for. 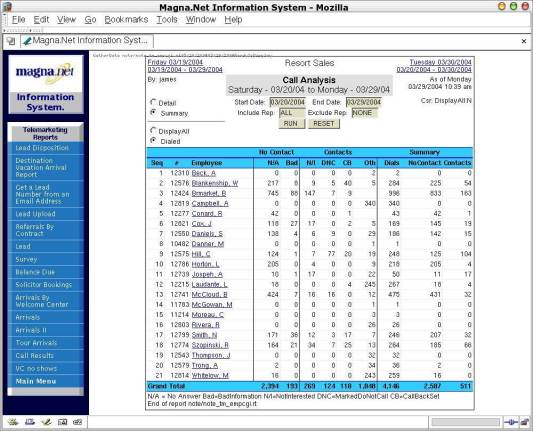 Magna can also create customized reports and interfaces. Comments: I really appreciate the assistance given by the entire customer support team at Magna, especially Emily Mazarro. Always provide detailed assistance and quick solutions to any problems faced whilst making use of the program. 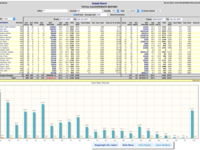 Comments: We use Magna at work to track our sales and contracts and it is a life saver. I would definitely recommend it to any business and the customer service is awesome.